Journey with us on our Mauritius getaway, a star in the constellation of Indian Ocean islands. We travelled for a week between April and May when the weather was warm but not unbearable. After a short flight and being a little nervous about what we would find, we were blown away once we stepped into the humid autumn air. Who could be anything but cheerful when you live in paradise? 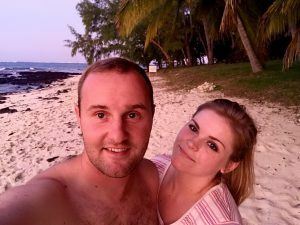 We stayed in Belle Mare, Flacq with our own private beach right on the property! Many of the Mauritian resorts and accommodation have access to private beaches or swimming pools but here the house was remote and tucked into the wild. It was the day before my boyfriend Tjaart’s birthday when tropical cyclone Fakir hit the shores of the island. The morning was spent safely locked indoors as our pristine beach disappeared under massive crashing waves and our palm trees were being plucked from the ground by powerful swirling winds. By that afternoon, however, the wind had all but disappeared and the calm turquoise ocean returned. A magical birthday gift arrived at our doorstep in the form of a local woman who greeted us with a warm smile as we tentatively opened the door to assess the damage. She showed us a box full of freshly caught seafood from which we chose a lobster for the afternoon barbecue. In Mauritius you can be assured that everything is always fresh and tropical! While almost everything could be found at our accommodation, we opted to venture out to Grand Baie to scour the markets on our third day. Here we found curios and the usual tourist assortment that can be done on a Mauritius getaway but the day after the storm, a local guide pulled up to the house with an entire bus just for us. He proceeded to take us on a special tour complete with a panoramic view of the island, fresh coconut and sugar cane juice! We found the Rhumerie de Chamarel Distillery where rum is made – a local specialty. Next, we headed off to Chamarel Waterfall which has a pool for swimming below. It’s also possible to trek to the Seven Coloured Earths from here and the walk there is considered one of the greatest hikes throughout Africa because of how rare the sights are, complete with endemic fauna and flora. 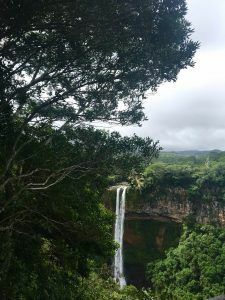 Last, we explored the Trou aux Cerfs, a dormant volcano that showcases lush forest scenery and a crater lake where an array of colourful birdlife resides. 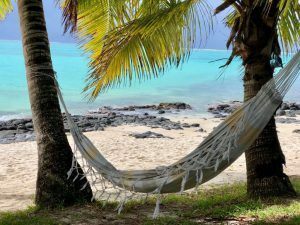 We had rented a car for the trip but only used it once to get groceries because the island turned out to be very accessible – plus the beauty of the surrounds could be seen right from our beach. Directly after the storm we found the roads inaccessible due to water or fallen vegetation and we thought it best to just absorb the tranquility of island life. 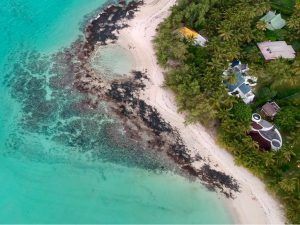 Some other wildlife activities offered included taking a walk in search of rare Aldabra Giant Tortoises (originally native to Seychelles) or a swim with the Bottlenose dolphins. Finally, heading home was a melancholy feeling (sweetened by some final sips of coconut juice) but we so enjoyed our adventure that we’ve both decided we definitely have to travel back at some point. We hope our journey inspired you as much as it did us. 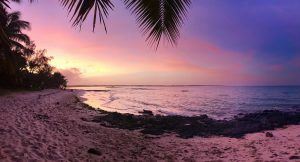 If you’re looking to plan your own Mauritius getaway, speak to one of Rhino Africa’s travel experts and create a bespoke Indian Ocean island adventure.